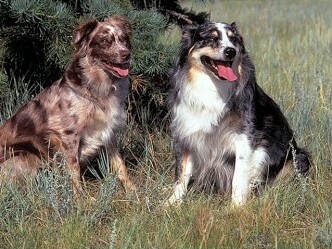 The Australian Shepherd had its beginnings in Spain and Andorra. The Australian sheep were imported into the western U.S, once more the Basque herders and their dogs, now renamed as Australian Shepherds, made the trip. The Australian Shepherd is eager to please, loyal and responsive. Though a deliberate guardian, he is never hostile. Alert and quick to learn, he is easily trained and high spirited. This breed thrives on activity and needs regular and challenging outdoor exercise. Coat: The coat of an Australian Shepherd is of medium texture, straight to slightly wavy and of moderate length. Hair is short and smooth on the head, the front of the forelegs and below the hocks on the hind legs. There`s moderate curls and frills. Grooming: The ideal coat is one of low maintenance and very strong. Depending on the surroundings, burrs, mud, snow and other irritating conditions, it should be able to keep neat with regular brushing and the occasional bath.